About Us / About the Facility / How were public areas named? 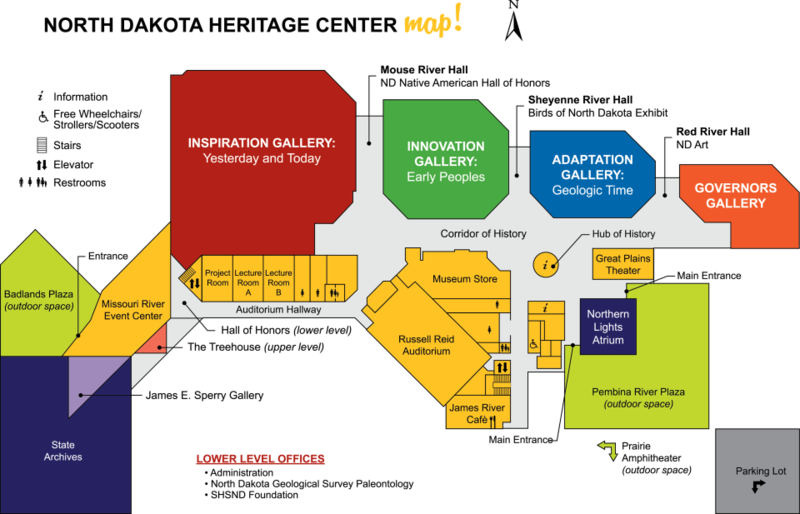 To emphasize our statewide focus and the importance of the land to our people, geographic landmarks from across North Dakota have been used to name areas of the building. These names correspond geographically from the eastern to western parts of the state. Along with the Great Plains Theater, Northern Lights Atrium, Prairie Amphitheater, and Badlands Plaza, areas of the building were given names of North Dakota rivers. Beginning outdoors in front of the Northern Lights Atrium, the east entrance to the building, is the Pembina River Plaza. The hallways that link the four main galleries are the Red River Hall, Sheyenne River Hall, and Mouse River Hall. Also located near the east side is the James River Café. At the west side of the building is the Missouri River Event Center.